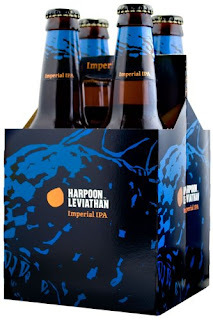 So, many people I know use the Harpoon IPA as their barometer of a good IPA, so I was puzzled when I heard they rolled out the Leviathan Imperial IPA, I mean why ruin a good thing? The thing is, the texture and taste are vastly different, you wouldn't know these beers were even related. The Leviathan has a strong alcohol bite. It bitters the tongue as well as the recesses of the mouth and throat. The alcohol tinge dissipates enough to allow you to catch the grapefruit undertones. More carbonated than other imperials which tend to go syrupy in texture. The 10% ABV is something to be reckoned with. The Leviathan, much like it's Harpoon predecessor also gets a 4.0, but for different reasons. You definitely have to be looking for a sharp beer when trying this one.